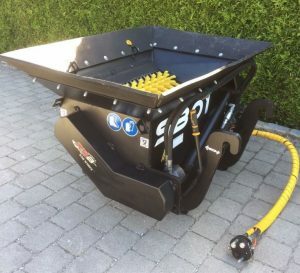 The excavator sieve offers a unique way to dig up soil and sieve out the larger materials to be able to sue the soil for you project quickly and affordable. If you are gardening or landscaping the SBO1 sieve is a perfect attachment. The RSB SIDE WORKS sieve offers grading of approximately 25mm (1 inch) for screening top soil, gravel, and other screening materials. It saves a lot of transport and disposal costs for the material. With its compact dimensions of (L x W x H) 1.22 mx 1.60 mx 1.22 m and a weight of 420 kg, it can be driven to the place of use on every conceivable means of transport. The screen starts at the 25 mm grading curve are in continuous motion. The speed of the excavator with the potentiometer on the right hand control console in the driver’s cab adjusts steplessly to the requirements. The spoon allows a continuous filling. This eliminates long waiting times during the screening process. For the employment this means a time saving of up to 50%. The bucket may be emptied of the bucket operator from his place in the driver’s cab: e.g. in the bucket on the boom and from there directly into the truck for transport.